If you cast your mind back two weeks, you might remember I posted about the 5 Pointy-Toed Flats I’m Currently Crushing On. 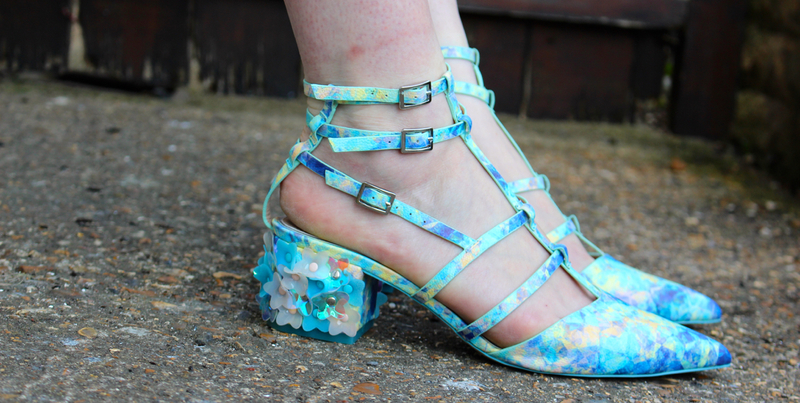 And that one of those five pairs had a pastel print, caged straps, pin buckle fastenings and 3D floral appliqué heel. I crushed hard and caved in to buying them. Whoops! Guess I got sucked in by my own words. First off the colour and brushed pattern sums up summer for me. I love nothing more than a pastel shade in the sunshine. When you add to that the three cage-forming straps, I’m sold. Plus, the fact that these are actually super comfortable meaning they won’t be leaving my feet any time soon. Just look at those heels though. I mean, my heart melts every time I look at them. Words can’t explain how much I love them. ASOS, you are not failing me in the pointy-toed shoe department. Get your pair of Spectacle Caged Pointed Heels now. I promise it’ll be the best £45 you spend.